The advent of E-Commerce has completely redefined the marketing landscape and the way in which marketers interact with their target audience. 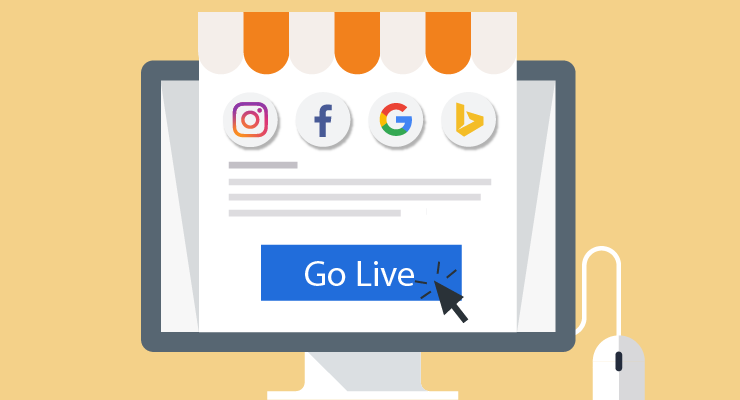 With new E-Commerce stores opening every day, shoppers have become spoiled for choices and keeping shoppers engaged with your brand has become quite challenging. You need to use out of the box and well-crafted marketing methods to maximize revenue and ensure your shoppers become your customers. 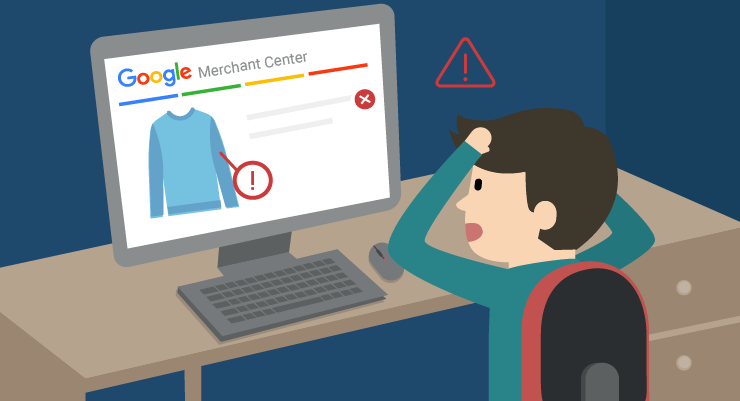 So, how do you as an E-Commerce business help your customers find the best products they’re looking for? One of the most effective ways to do that is through E-Commerce Personalization. E-Commerce personalization is all about creating super relevant shopping experiences and interactions for your shoppers based on their browsing behaviour, interests and demographics. 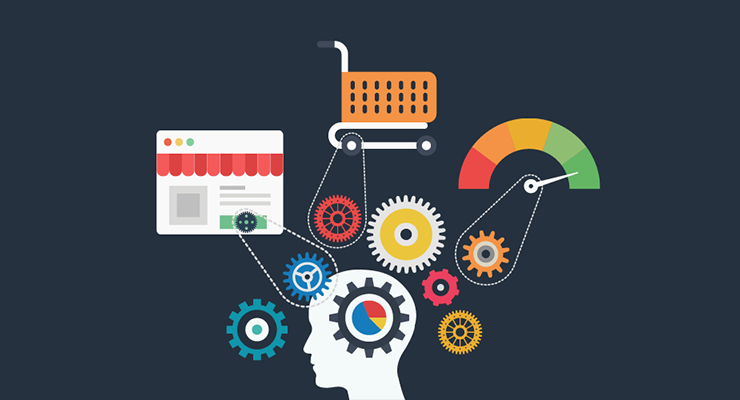 Why is E-Commerce Personalization important? If used correctly, E-Commerce Personalization can prove to be a strong weapon for online retailers to boost revenue and increase profits. 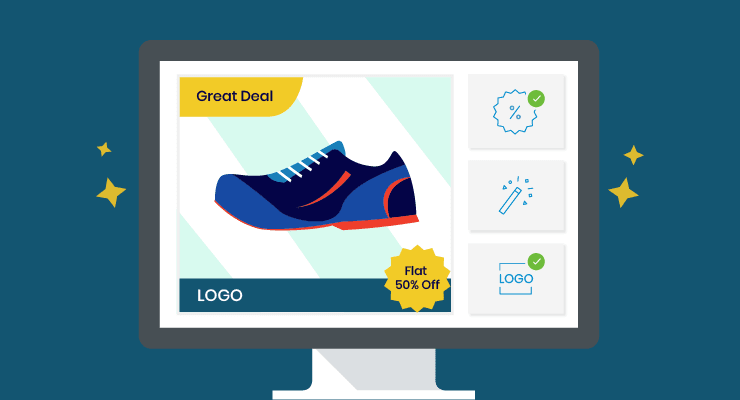 By personalizing the shopper experience for your website visitors you are showing them the products they’re really interested in, at the price point they’d like to buy and helping them arrive at a decision faster. Unlike other websites, where the users are overwhelmed with options. If I were to ask you which website would you like to visit, what would your answer be? 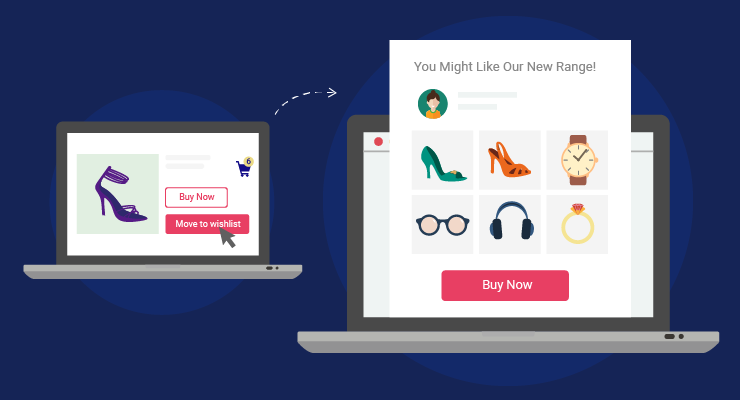 How does E-Commerce Personalization work? 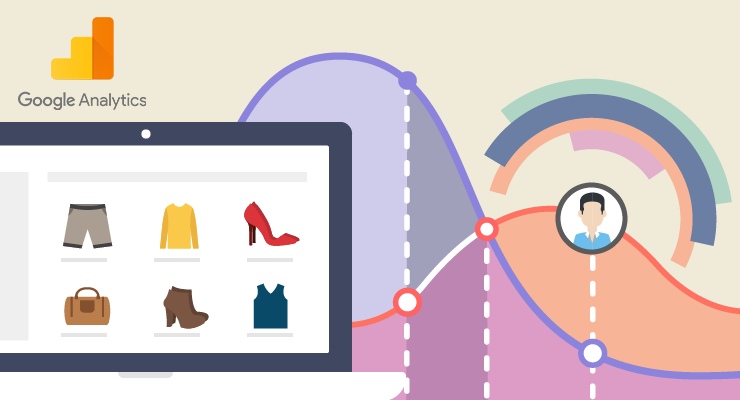 E-Commerce Personalization begins with data collection. 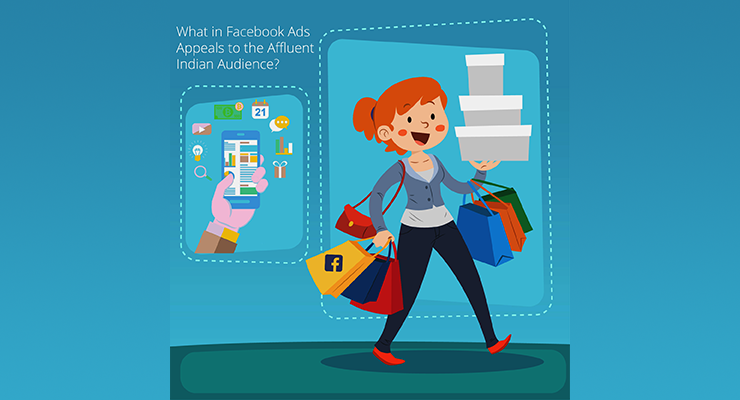 You should know what your customers are looking for, what their interests are, their budget preferences etc. Only then would you be able to truly personalize their shopping experience. 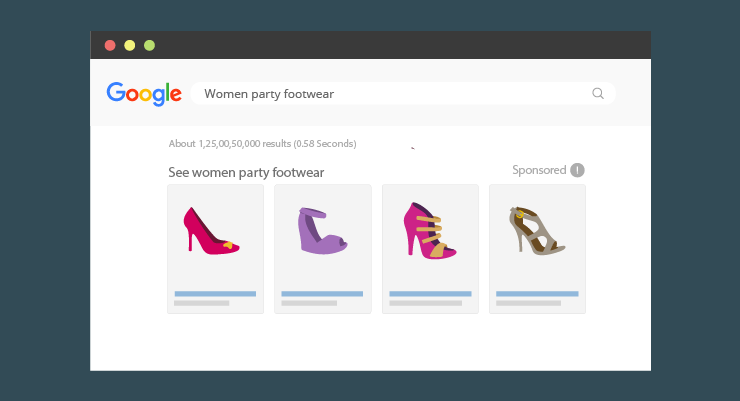 On-site interactions (category and product page visits). 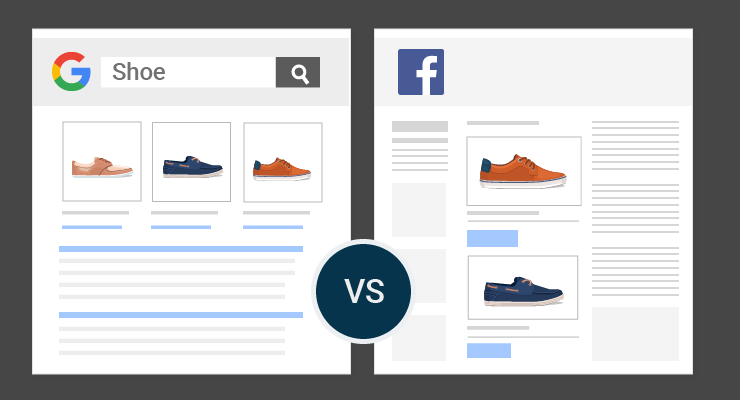 Paid Media Pixels (both social and search). Email is the most powerful organic channel when it comes to E-Commerce marketing. The first step any E-Commerce business should take, before starting email marketing is to dynamically segment the website visitors according to their on-site behaviour. 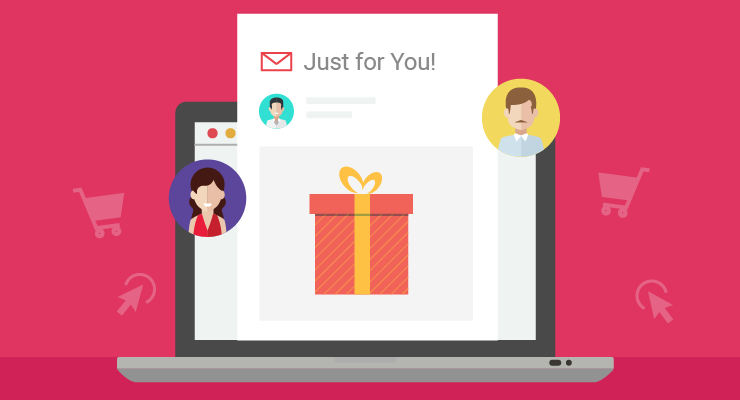 This segmentation will allow you to personalize the emails depending on the stage the customer’s currently in and also increases your chances of driving more conversions. For e.g., Joe adds a product to his cart, but does not complete the checkout process. You can set up a time-based email that reminds Joe to check out the product in next 3 hours and avail an exclusive 10% discount. Always remember, everyone loves a good mix of deals, especially when they are tailored exclusively for them. But the most important aspect here is the timing of the email. If you delay sending him the email, then he might change his mind. 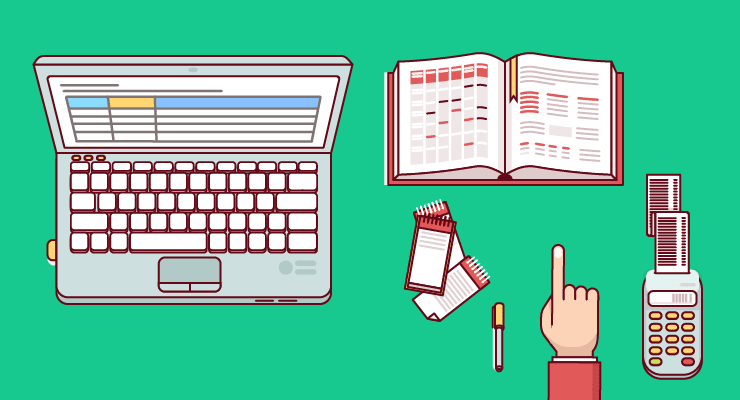 Here’s an Email Marketing tool for E-Commerce that can help you do just that. 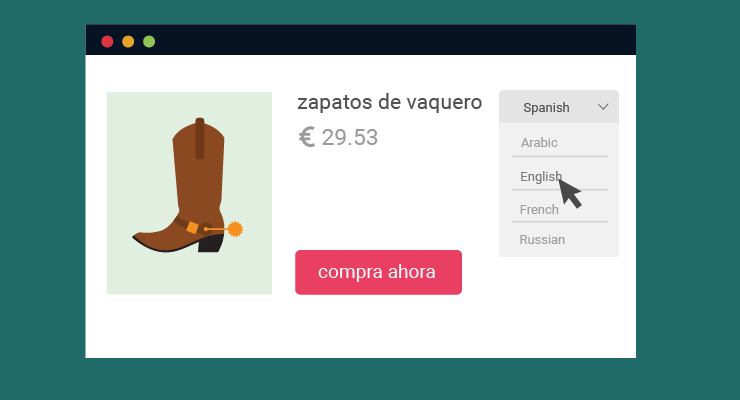 You can communicate in their local language: That way when a French user who doesn’t understand English visits your online store, can read the product descriptions in French and learn more about your product. Product pricing in their currency: The French user really liked what your product has to offer and is interested in buying it. Instead of seeing the product price in Pounds, he sees the pricing in Euros. Eliminating the currency conversion confusion for him and bagging another win for you! Seasonality based offers: To his luck – it was Bastille Day! He sees that you’re running a 15% discount for all your French users. He instantly checks out the product and BAM! You’ve got yourself a new customer. Well done. Just imagine how many more customers you can convert with Geo-based personalization, which otherwise might’ve just dropped off from your website after being unable to understand your offerings. Joe was really impressed by your email personalization and recommended his friend Samantha to visit your website. Next week, Samantha decides to visit your website in the pursuit to buy a T-shirt for herself. She selects her favorite brand and browses through different colors and patterns you’re selling. Samantha really likes the 6th T-shirt she comes across and spends a lot more time on the product page in comparison to others, but thinks she’ll visit other websites before making a decision. 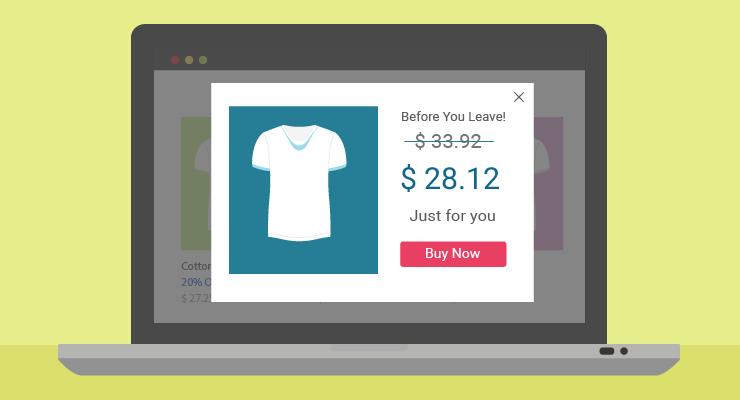 As she’s about to leave your website, she sees a pop-up message giving her a 10% discount on that T-shirt if she buys it in this session. Impressed by the price-point, Samantha buys the product using the exclusive coupon. Win-win for both! 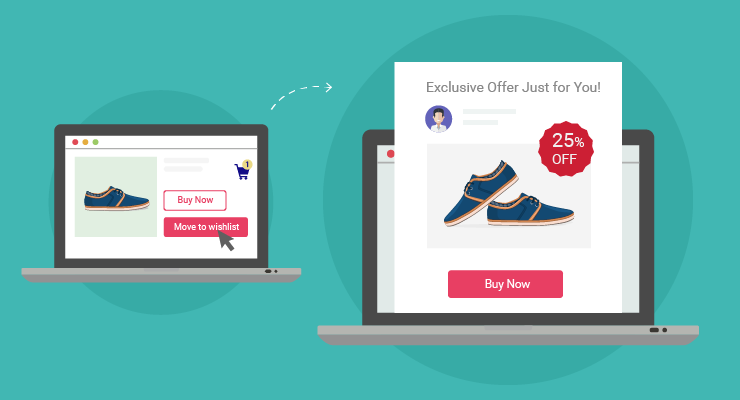 Giving out dynamic offers to your users on the website based on their browsing history, can really be a game-changer. 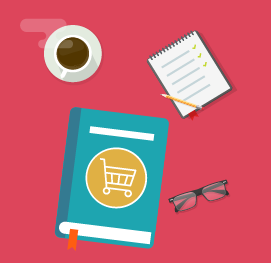 You will surely see a lot more users buying the products than abandoning their carts. Amy used to be a frequent buyer at your store, she had browsed through various product categories, added some products to her wish list and even bought from your store a couple times, but she hasn’t visited your website in a while. One day, she receives an email from your store that showcases her a list of products shortlisted based on her browsing and buying patterns. 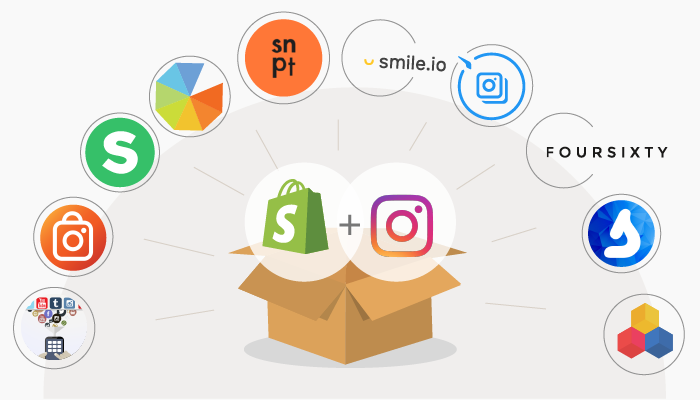 She really likes the curated set of products and decides to instantly visit your website and buy them. Amy’s happy that she didn’t have to waste her time browsing through hundreds of products and you’re happy to have successfully won back Amy as a customer. 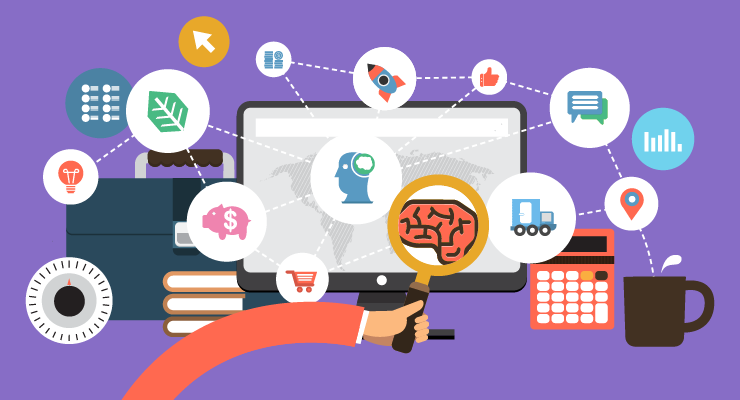 As an E-Commerce company, if you prepare a curated list of products based on your customer’s browsing and purchase history, they will waste less time browsing and deciding the products they want. You can also notify them about the curated list through the channel they’re most active on Desktop, Mobile or Email. Focus on simplifying the shopping experience for your customers and you will never stress about not getting enough sales. 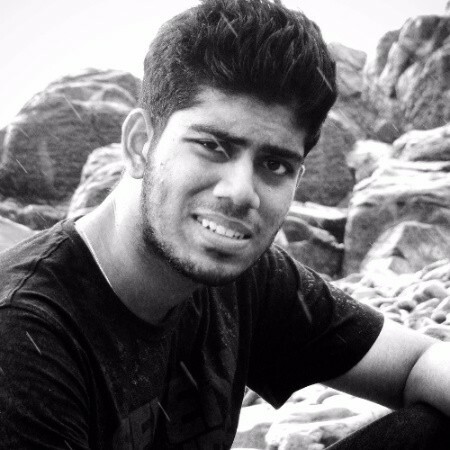 David is one of your most loyal customers, he’s been with you since you started your online store and continues to buy from you frequently. He has also referred a couple of his friends to buy from your website. When you find someone like David, who’s contributed to your store’s growth from the start and has been an advocate of your brand, it’s only fair to let him know that you value him as a customer. 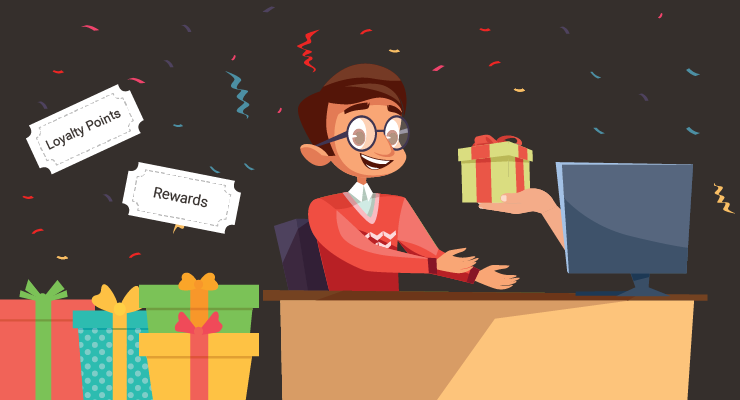 Create a loyalty program for your store, if you don’t already have one, and reward your repeat customers by giving them exclusive offers, loyalty points, early access to new products. Treat your customers like family and they’ll ensure the family keeps growing. 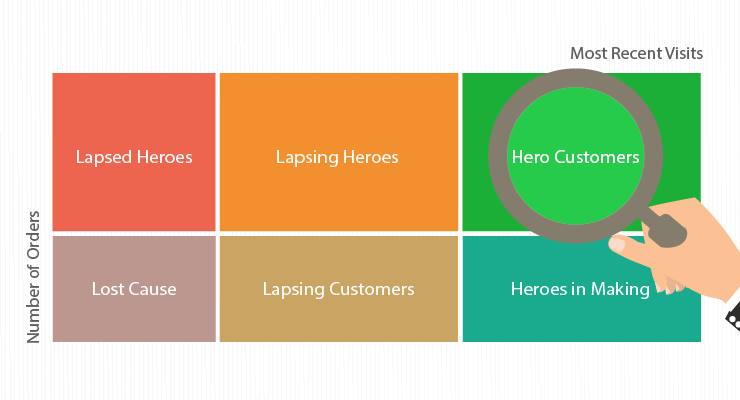 As a best practice, you should always segment your customers based on the frequency of their purchases. It will allow you to reward the ones that are actively buying from you and reactivate the ones who are starting to slip away. Emily is very particular about her buying preferences and is currently going through the Handbags from her favorite brand, priced between the range of £60 – £100. You have an extensive catalog and Emily doesn’t have the time to browse through all the handbags you offer. Emily goes to the product page of a handbag she sort of likes and while reading more about the product, she sees the recommended handbags section. This recommended handbags section is personalized according to her filters and lets her view similar handbags at a glance. Emily really likes one of the handbags she sees in the recommended section and buys it. 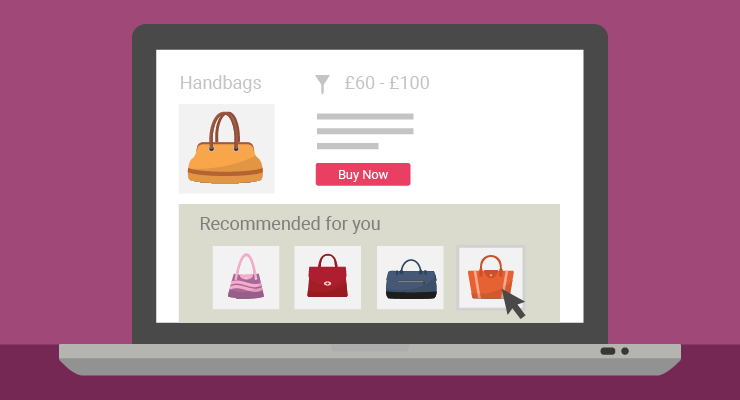 By showcasing recommended products that are based on your shopper’s browsing patterns on the products page, you instantly boost your catalog visibility and give your shopper a chance to see more of what they prefer and increase sales. 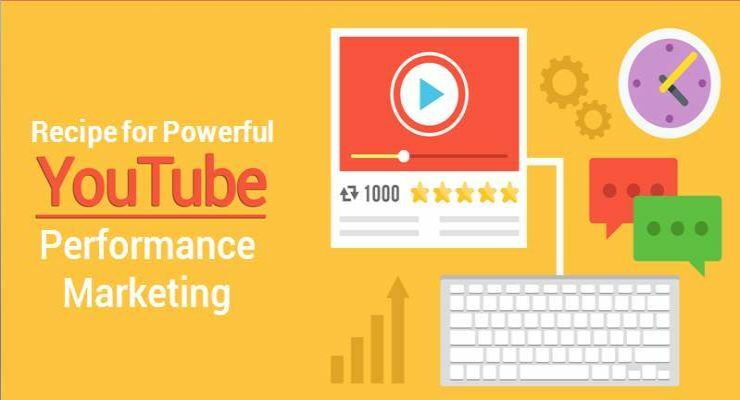 One of the best ways to influence the purchasing decision of the shoppers on your website is by leveraging customer reviews. A study by BrightLocal states that 88% of online shoppers incorporate reviews into their purchase decision. 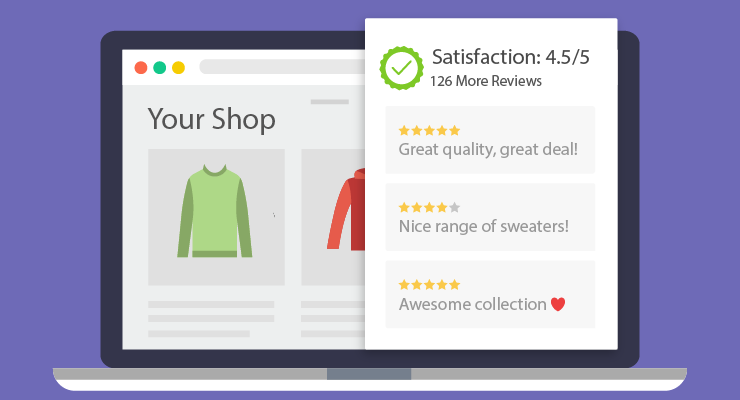 Integrating customer reviews while displaying product recommendations will help you drive more click-throughs and in-turn more sales for your business. 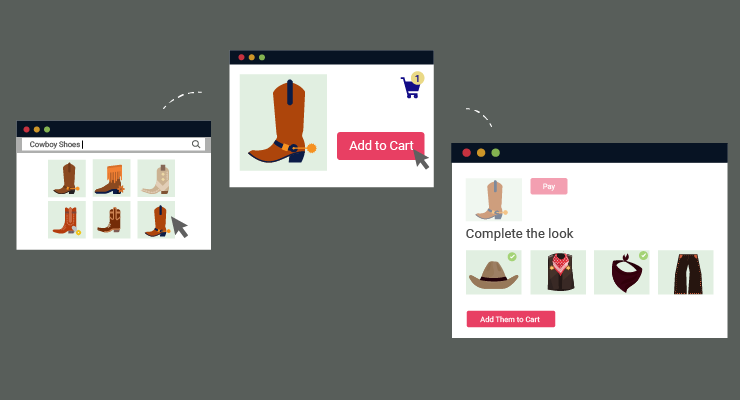 Chris loves the Cowboy boots he sees on your website, he adds them to his cart and proceeds to checkout. Before completing his checkout, he sees a Cowboy hat and a Jeans that would go perfectly with the boots he’s about to purchase and the Shirt he purchased last week, with a CTA that says – Complete Your Look. Chris loves the idea and decides to buy the Cowboy Hat, Boots and the Jeans. Leaving your online store with a satisfaction of completing his Cowboy look. In the end, it’s all about helping your customers buy the products they want, without having them go through your entire catalog. Make the shopping experience extremely personalized for them and they’ll always keep coming back for more. 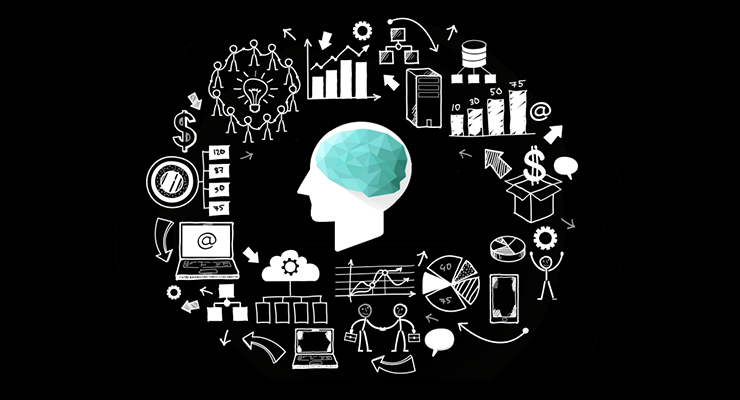 That sums up our list of 7 E-Commerce personalization tips that you can use to drive more sales right away. We would love to hear your thoughts on E-Commerce Personalization in the comments section below. Originally published at blog.ekomi.com on October 24, 2018.